JACHS NY: Timeless styles modernized with unexpected details and finishes. Classic shirts that are luxuriously comfortable and our bottoms are timeworn like your favorite pair of pants. 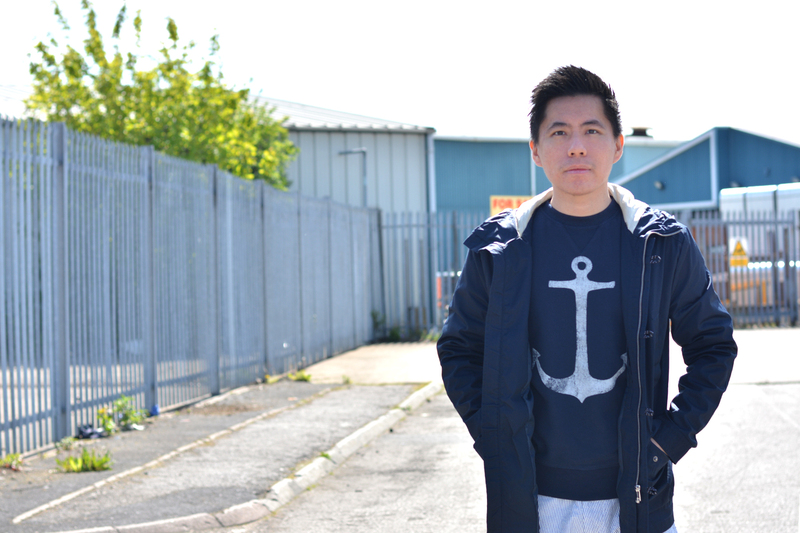 Apart from the chic design of the garments, their clothing is exceptionally comfortable. 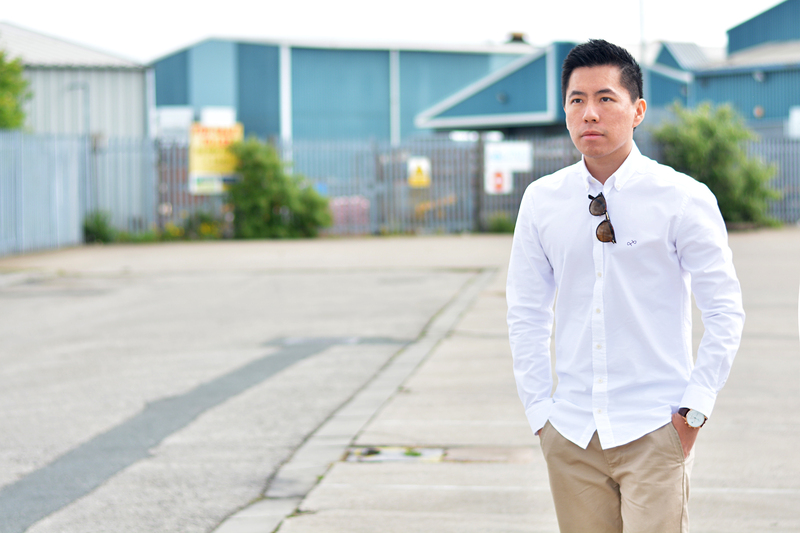 They have wide range of shirts from cotton, denim to linen. 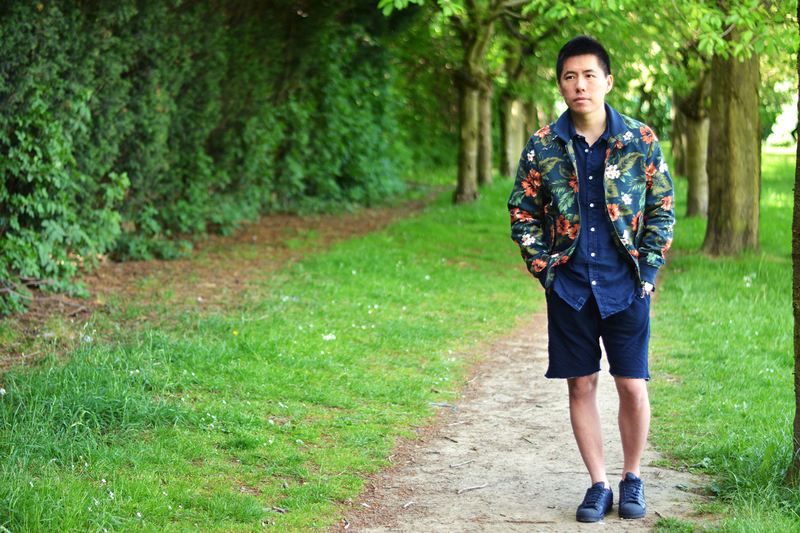 HEAD TO TOE: Floral Printed Harrington Jacket, Solid Navy Linen Shirt, Navy Dual Fold Knit Short, Adidas Supercolor. 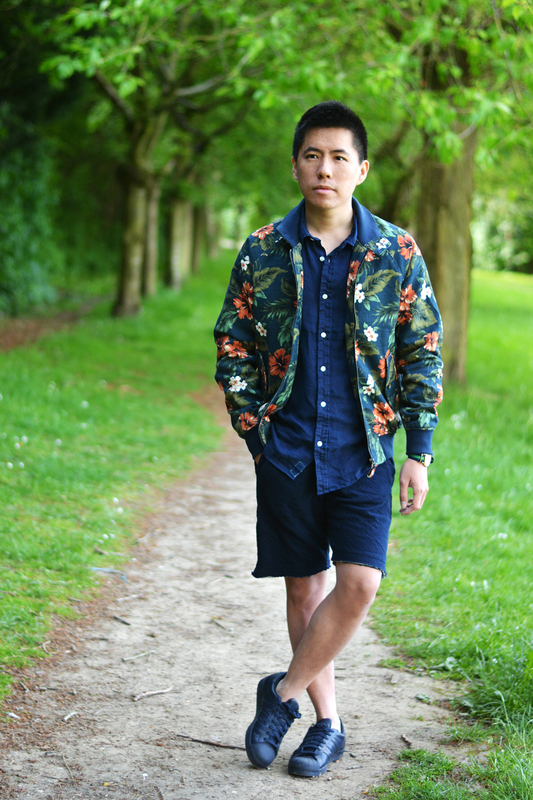 The Floral Printed Harrington Jacket and Navy Dual Fold Knit Short are made from 100% cotton and they are very comfortable. 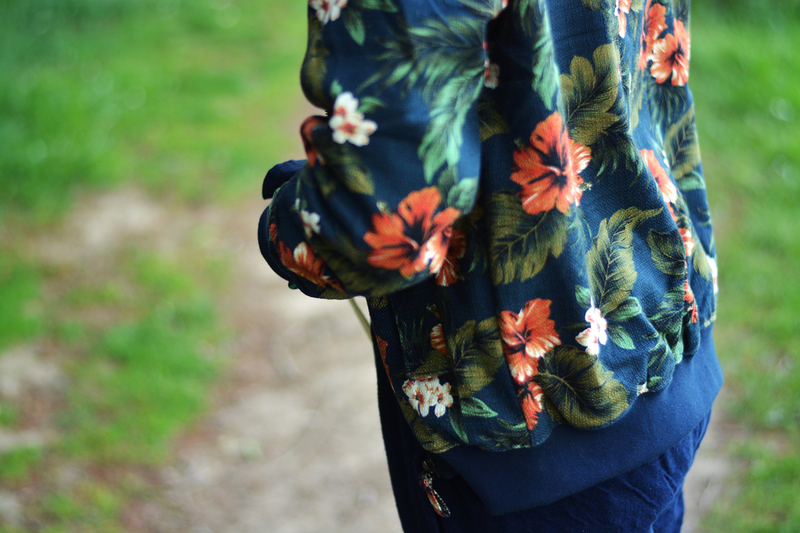 The floral jacket is perfect for this Spring/Summer with tropical essence. 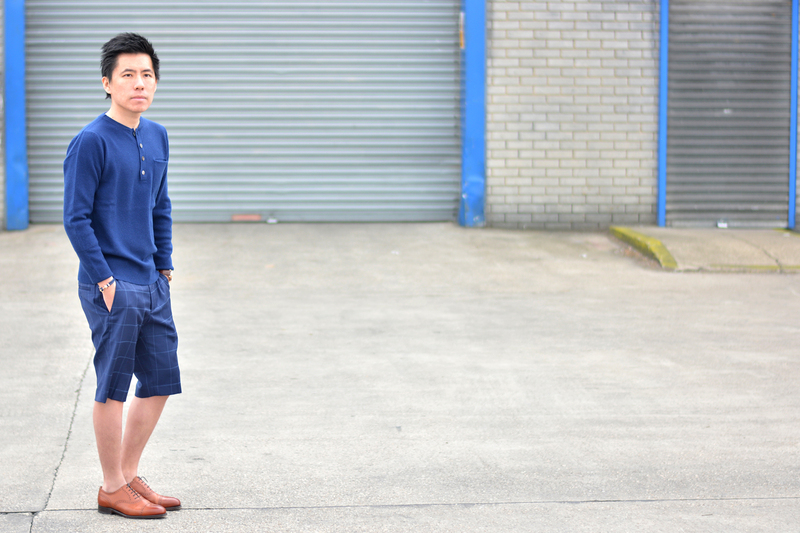 I love the texture of the shorts as it has a unique ribbed pattern on the fabric. 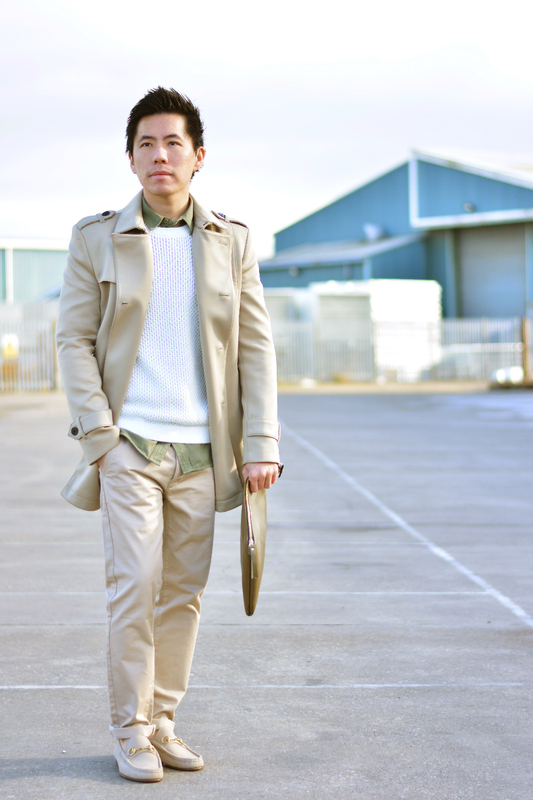 Please visit JACHS NY for more innovative menswear! 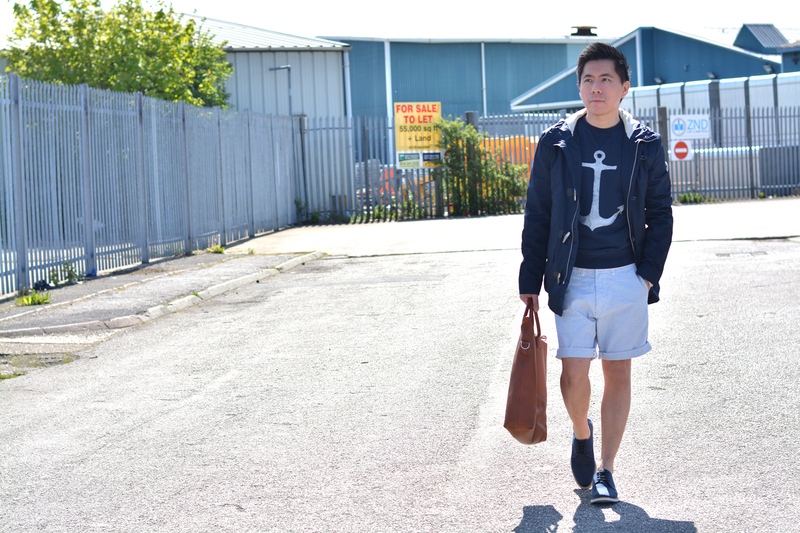 About Vintage is a timeless and elegant brand for all the true gentlemen. 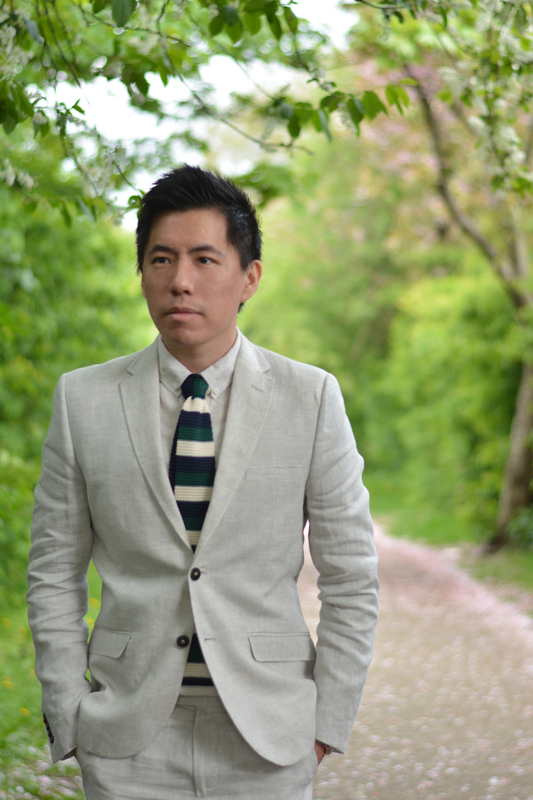 As a gentleman myself, I love to dress up confidently and effortlessly. 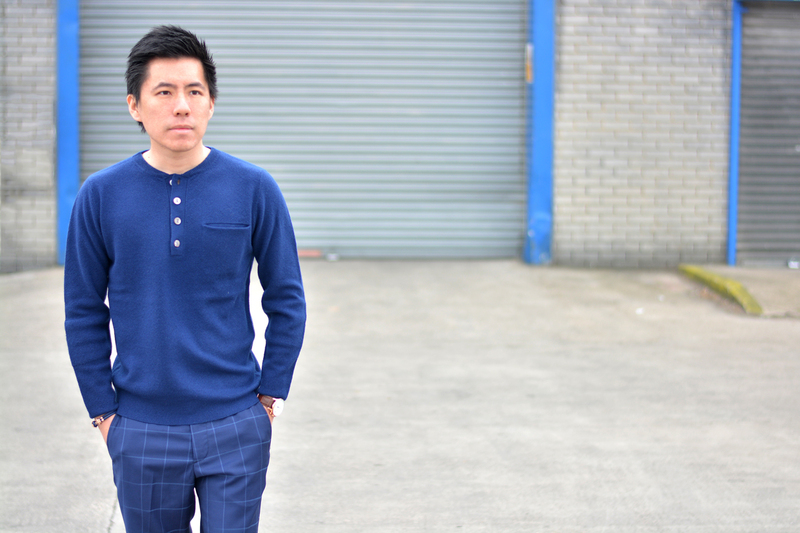 Even though their ‘Scandinavian Fit‘ shirt is tailored to fit Scandinavian, but I find their slim fit shirt collection is very well designed for any type of gentlemen. The most amazing product that caught my attention was their very first collection of watch. This LIMITED EDITION timepiece is one of the 100 individually numbered pieces. 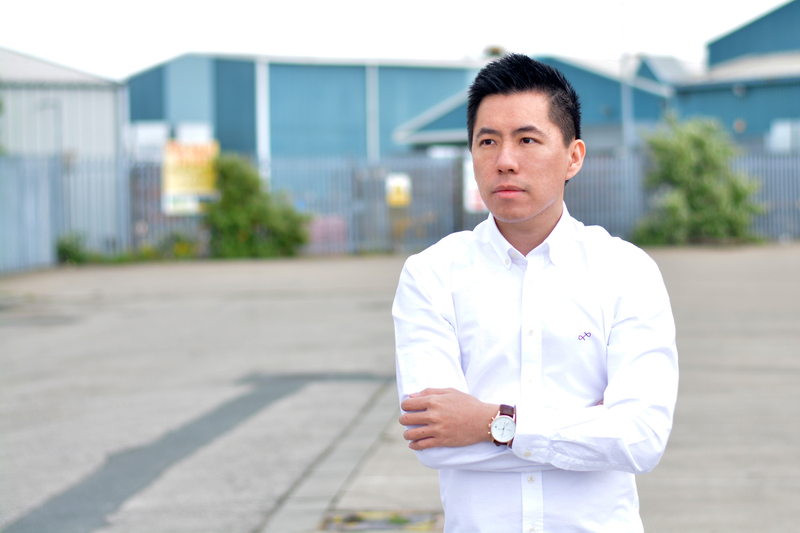 I am lucky enough to be one of the owners for this carefully designed chronograph watch from Copenhagen. 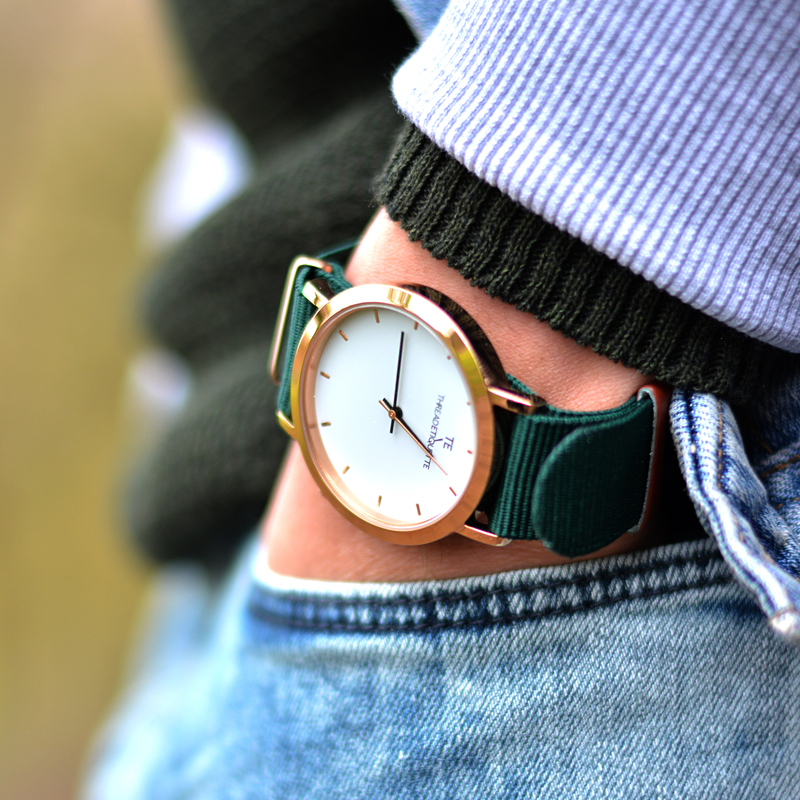 The Concinnus, Watch by About Vintage is neat, timeless and very elegant. 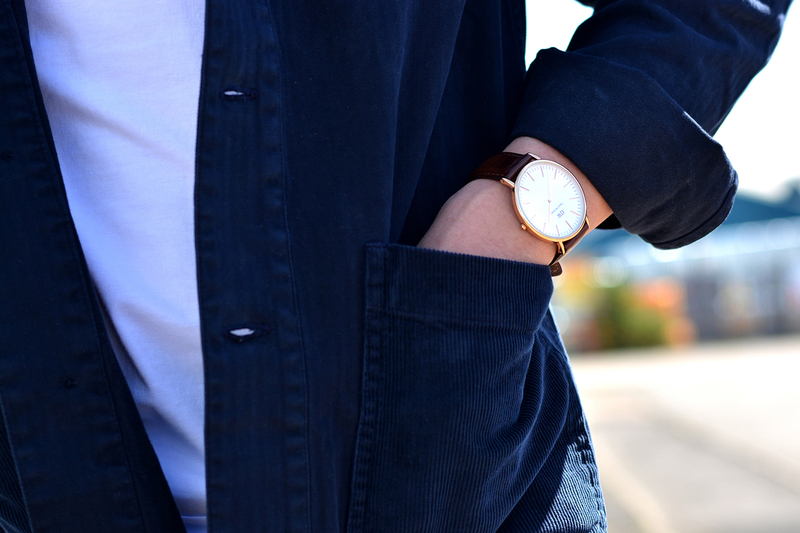 For me, a watch that a man wears reflects their identify. 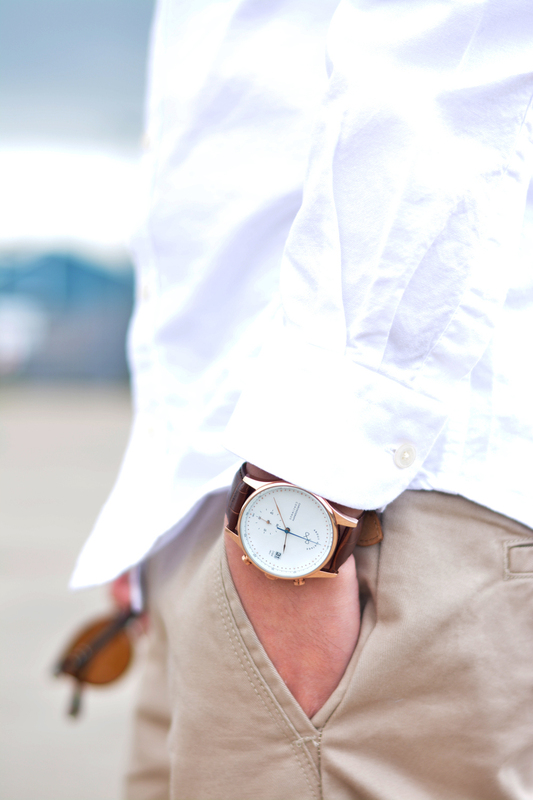 And this watch definitely reflects the class and taste of a true gentleman. The rose gold plated case is a perfect match with the brown leather strap, with a touch of the royal blue chronograph hand. 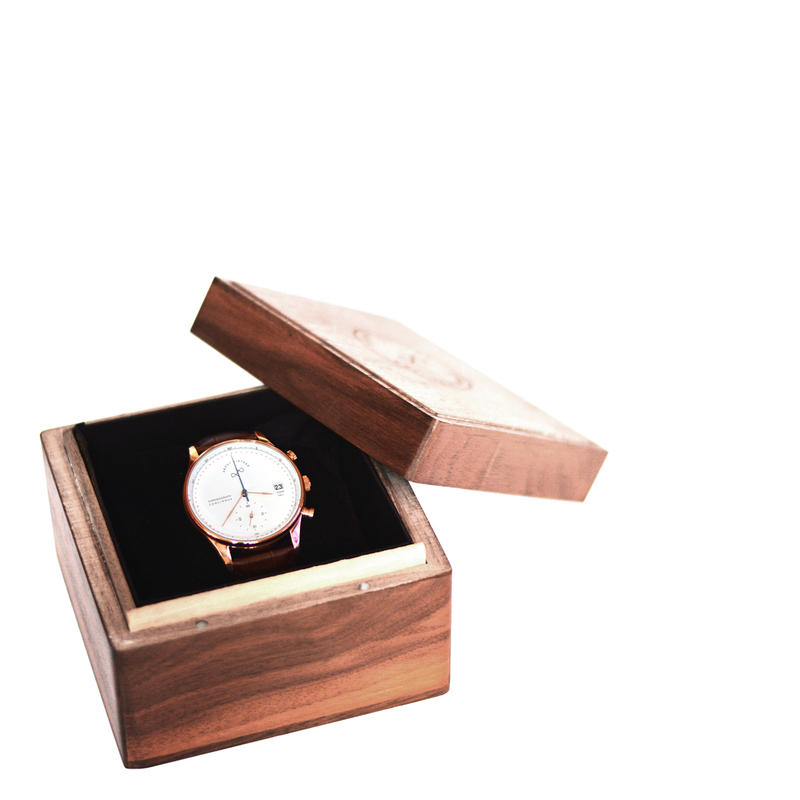 The watch also comes with a custom made box in beautiful walnut wood. 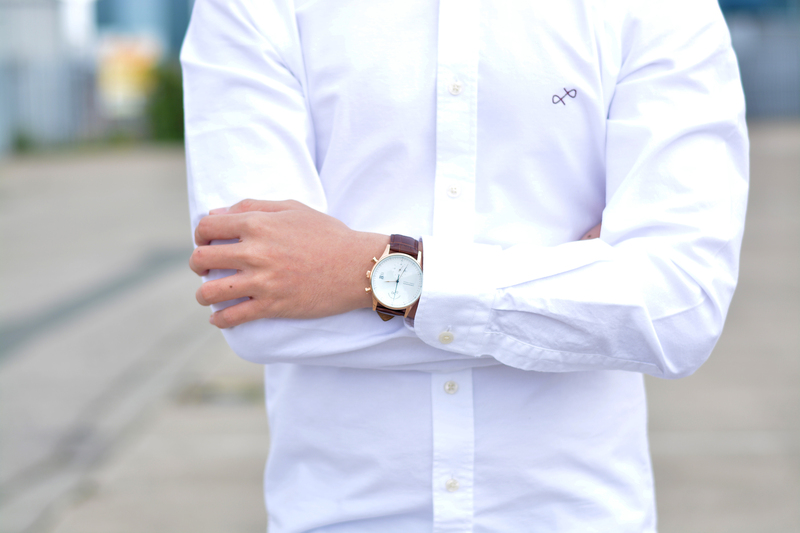 Please visit About Vintage for more choices of Scandinavian shirts and the limited edition timepiece in other colours. Inspired by his journeys and adventures throughout the world, the line Jacob Holston was created as an extension of himself and the very things he sees, loves and admires: amazing architecture, motorcycles, cars, formula one racing, a beautiful woman, a gorgeous beach anywhere in the world, fine food, a well-deserved cigar, and a finely aged scotch among other things. 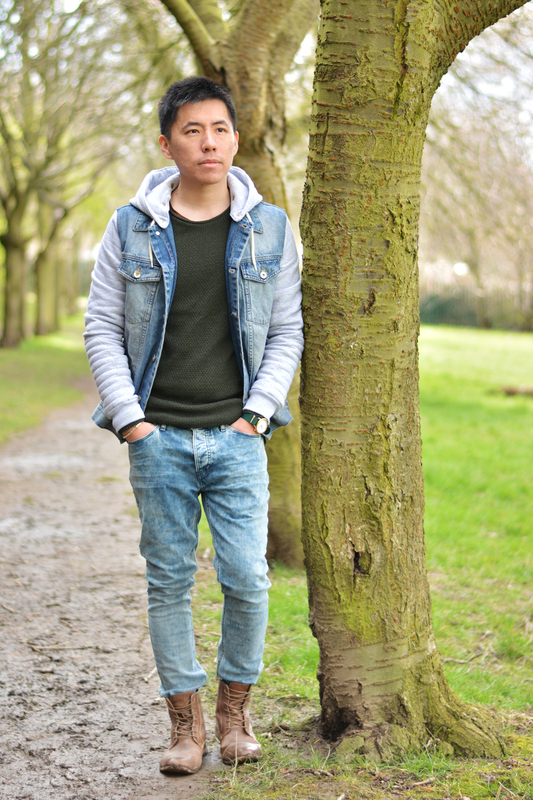 I will be showing you all how do I Jacob Holston in the coming weeks for Spring Summer collection. At the top I am wearing the beautiful Roberto Rib Collar Henley in navy blue and a pair of sophisticated navy plaid Bruno Dress Shorts. They are simple but effortlessly stylish. 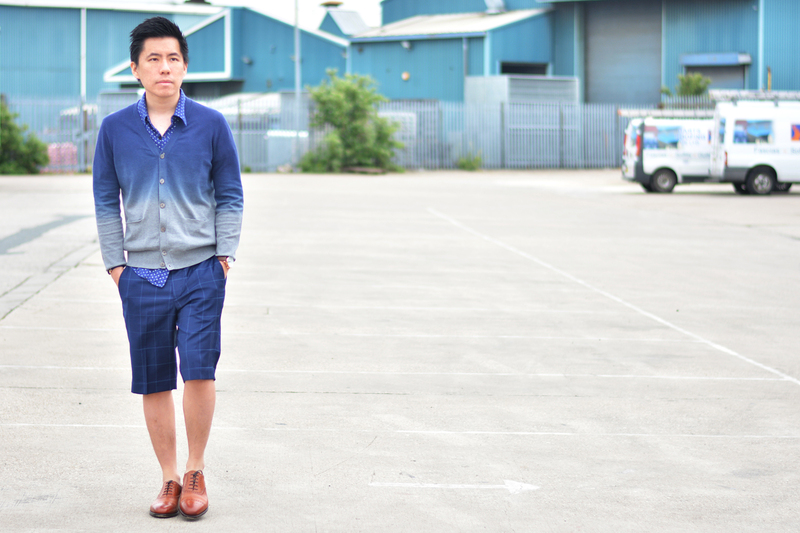 I have also paired the Fabio Ombre Cardigan with the same shorts and with a touch of Dino Short Sleeve Printed Shirt underneath the cardigan. 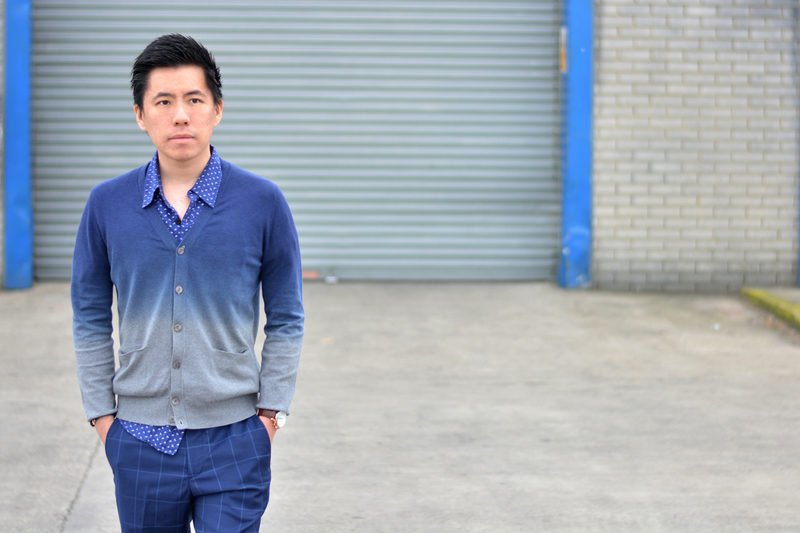 The gradient effect gives the cardigan a nice look and it is definitely less conservative for classy men style. 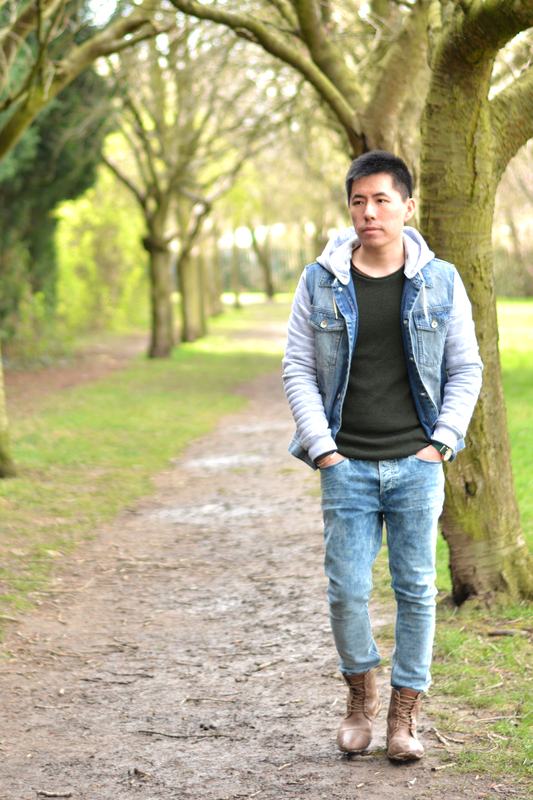 Nevertheless, the quality of all the garments is great, which is what you would have expected from designer clothing. 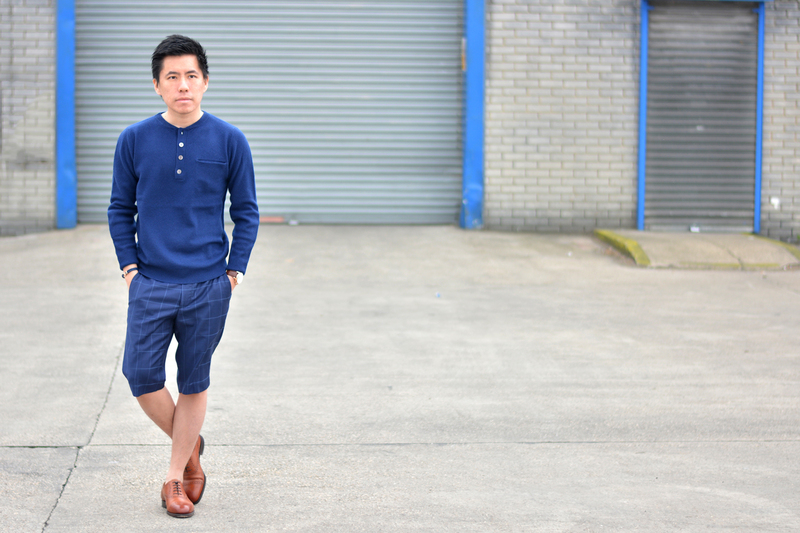 The detail of each garment is minimal but essential too to say the least! Please visit Jacob holston for more contemporary menswear! Feel free to visit their stores too! 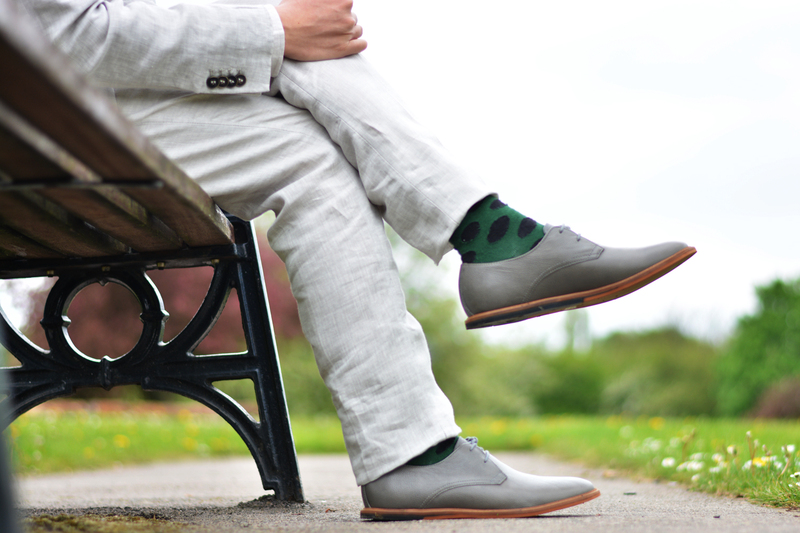 Frank Wright is a men’s footwear brand with a rich British heritage dating back to 1885. They carry a wide range of shoes from canvas to leather, as well as many beautifully crafted boots. 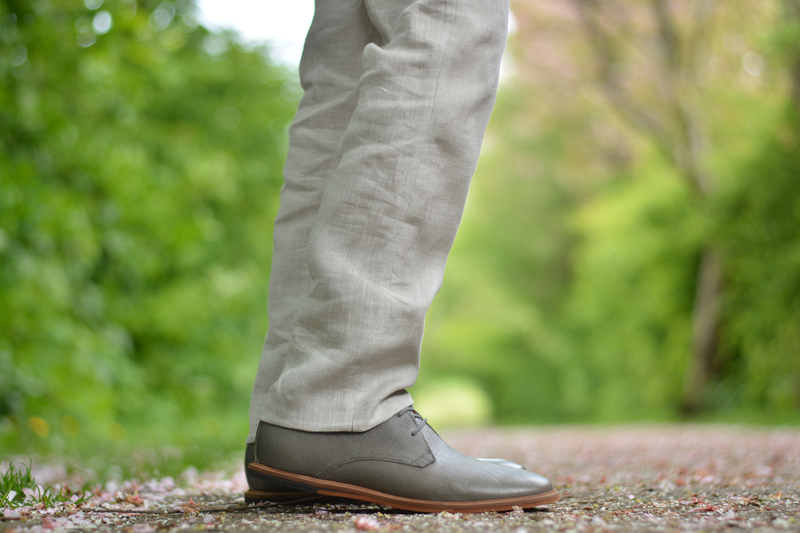 Busby Grey Leather Derby Shoe has a classic design that is suitable for any occasion from formal events to casual night out. The shoe has durable sole with affordable price. 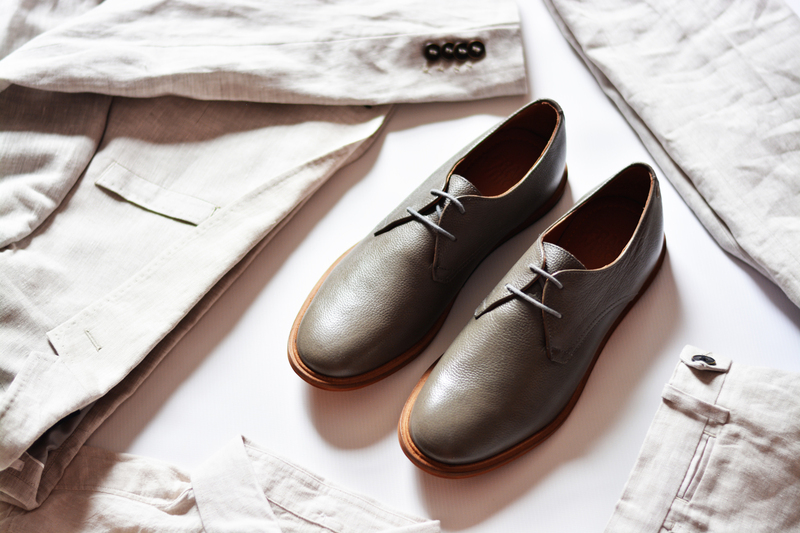 Frank Wright’s leather shoes are very soft and comfortable. The craftsmanship of the shoes are great and I love all the discreet details. These shoes are definitely worth investing as the price is affordable and yet the quality is great! 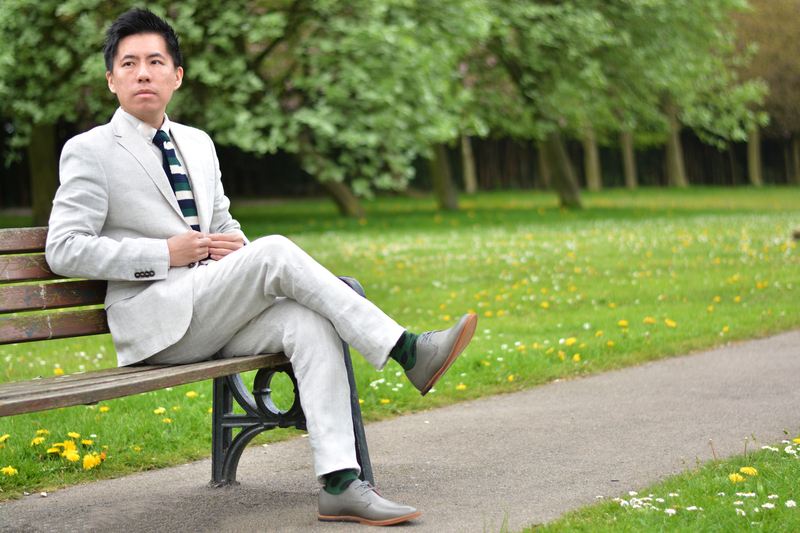 Please visit Frank Wright for more good quality dapper footwear! 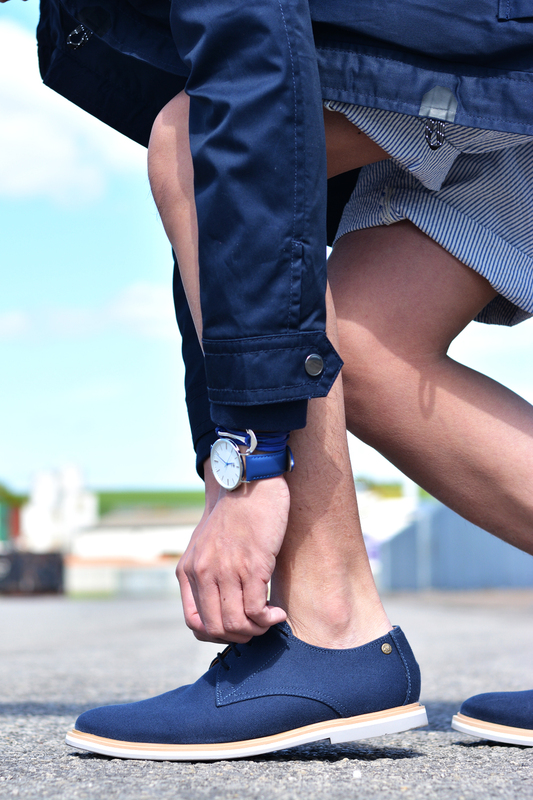 Telford Navy Canvas Derby Shoe is perfect for this Spring/Summer. 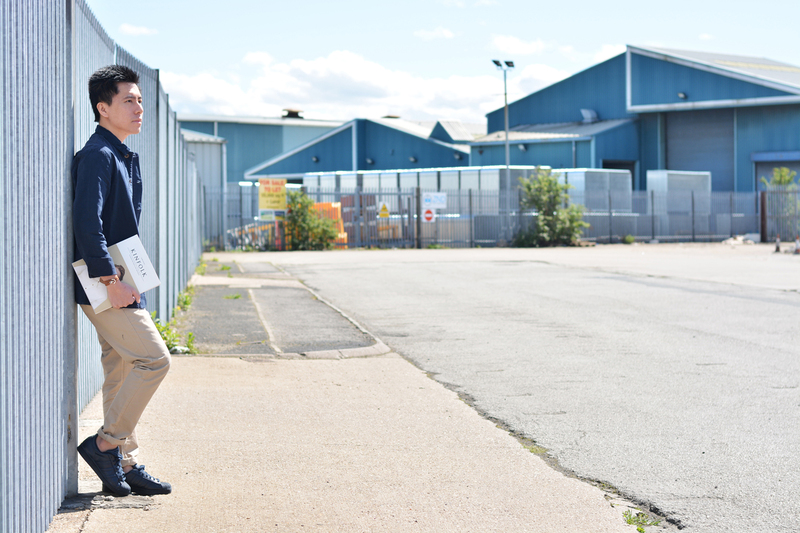 It is a perfect choice for day to day footwear with its durable sole and versatile design. My favourite part of the design is the tricolour sole as it gives the shoes a unique characteristic. The rubber sole also makes it more durable over rainy season. 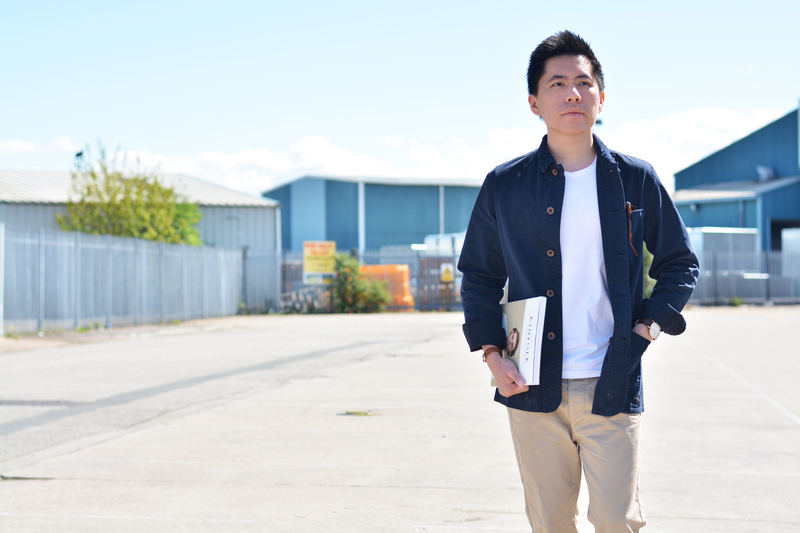 Need is a curated online retail and lifestyle magazine for stylish men. Their curation in each volume is unique, contemporary and essential. They carry clothing, accessories, grooming products, literature and more. 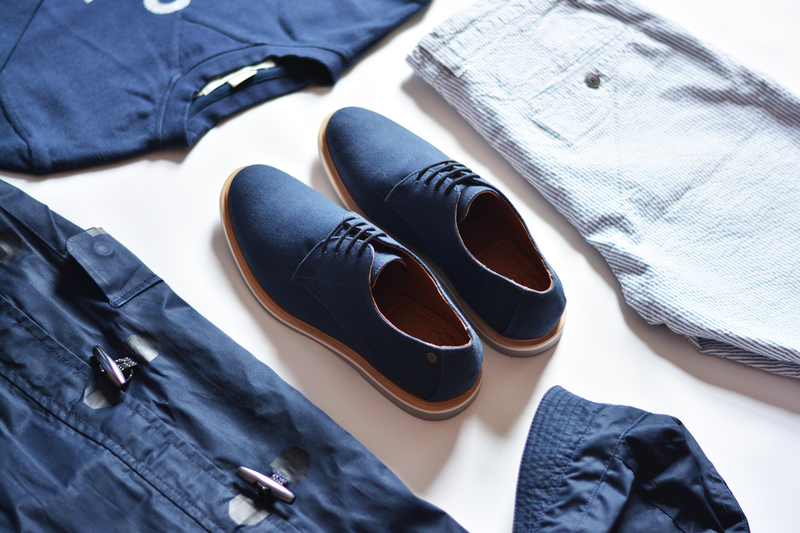 It is definitely one creative and convenient shopping destination for all the men’s needs. 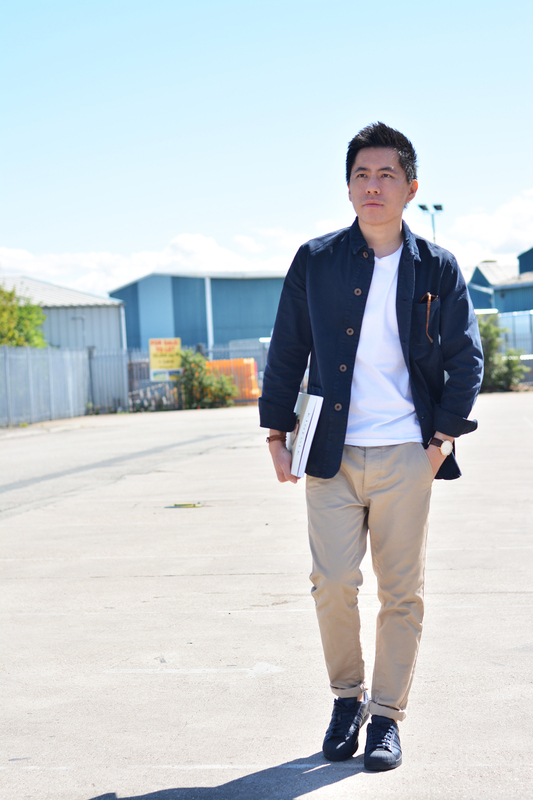 The jacket that I am wearing is Bacton Artisan Rifle Jacket from Realm & Empire which I got from Need. 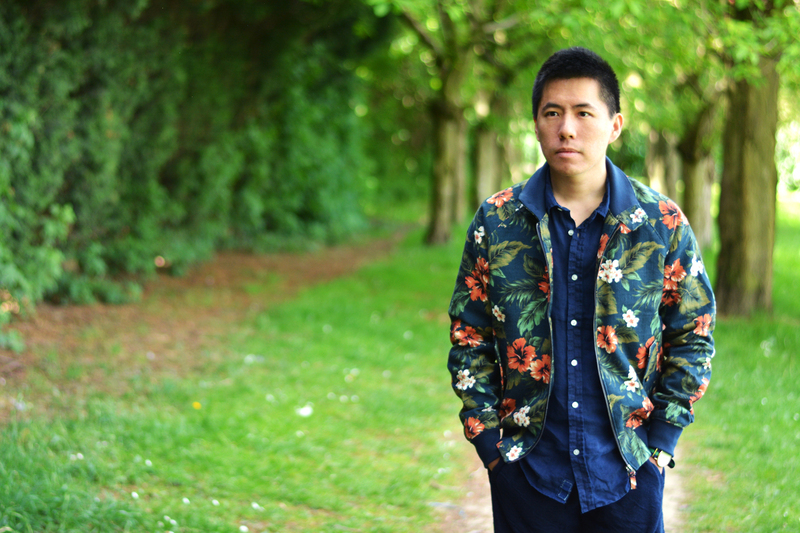 This lightweight Rifle Jacket is perfect for this Spring/Summer. It is comfortable on my body and effortless in style. 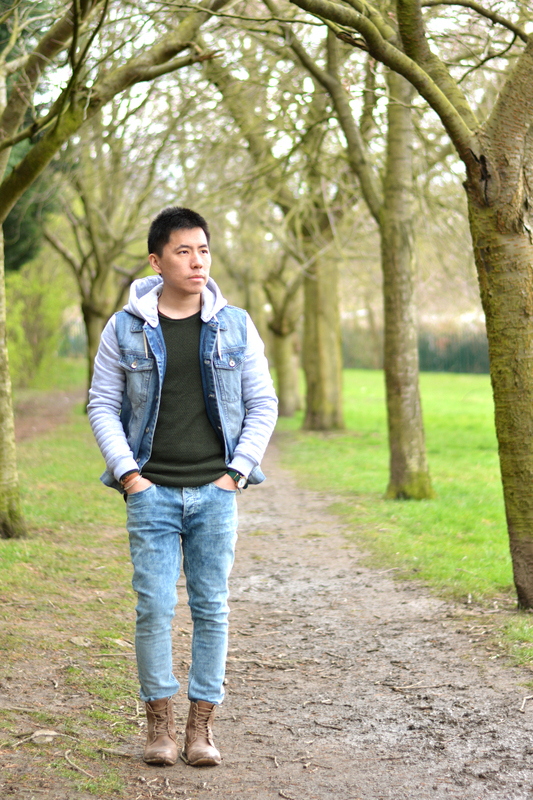 I am glad that I have found this brand through Need as it was like a love at first sight with its simplistic design and the touches of corduroy. 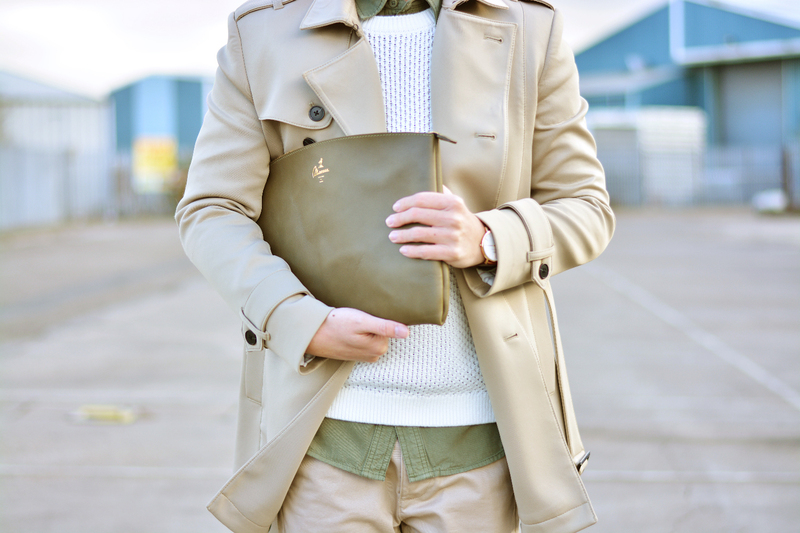 The pockets are made of corduroy which is a nice touch for the Rifle Jacket. 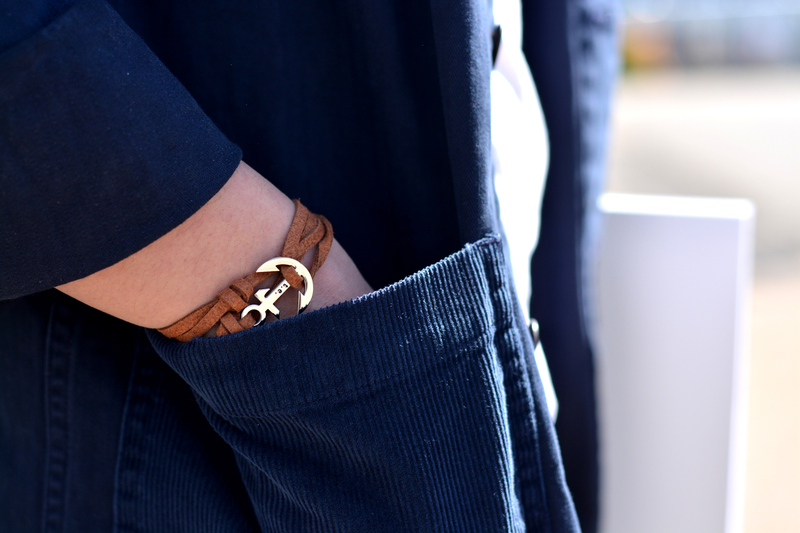 I am also wearing Thread Etiquette’s Leather Anchor Bracelet to go with this beautiful jacket. I also got Kinfolk magazine from Need, one of the many interesting literatures that they have curated. Please visit Need for more unique curation for a better lifestyle! Thread Etiquette is sharp, edgy and polished. 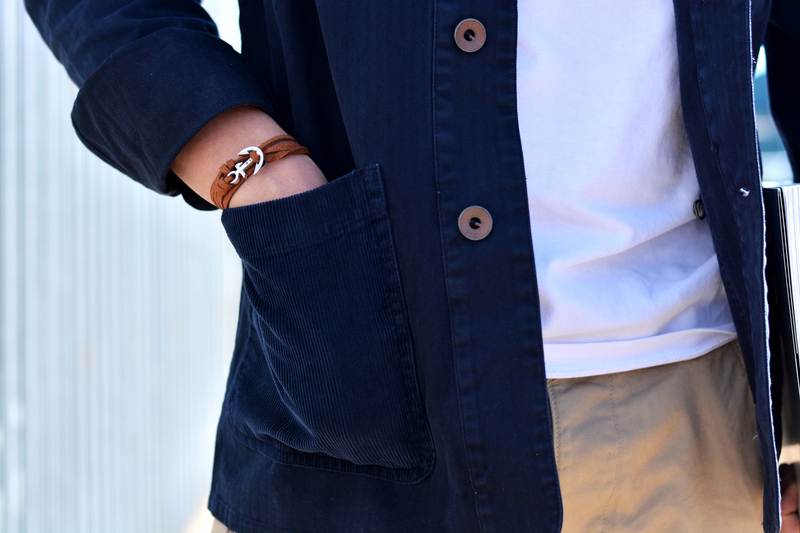 Their wrist accessories give you the versatility in styling from street look to smart attire. The craftsmanship is decent and yet affordable with high street price. Their watches are unique and edgy and I’m definitely digging the colourful straps. 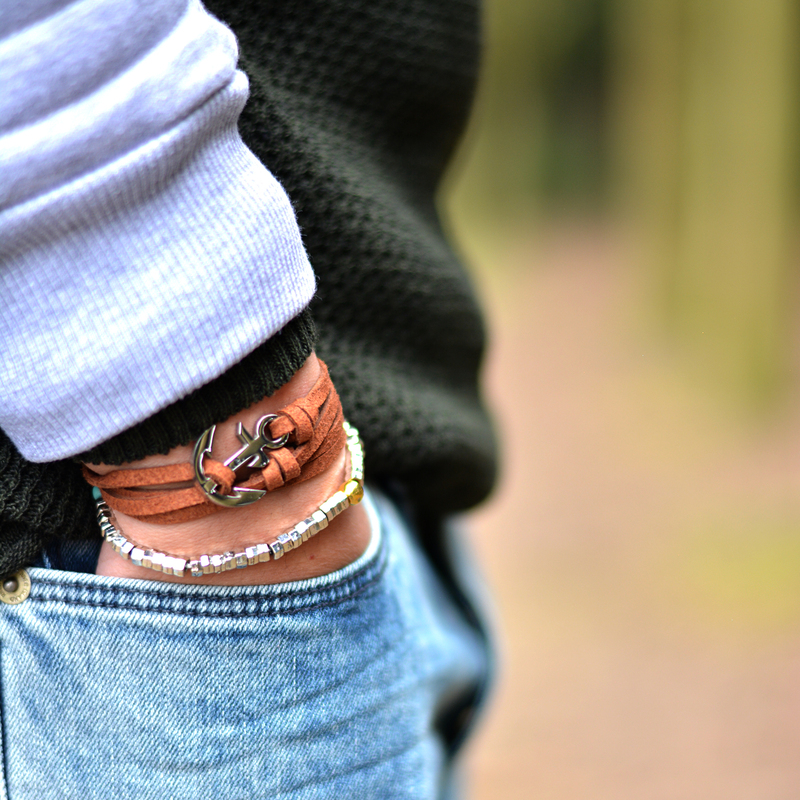 An outfit is not complete without wrist accessories as the details play an important role in finishing a look. 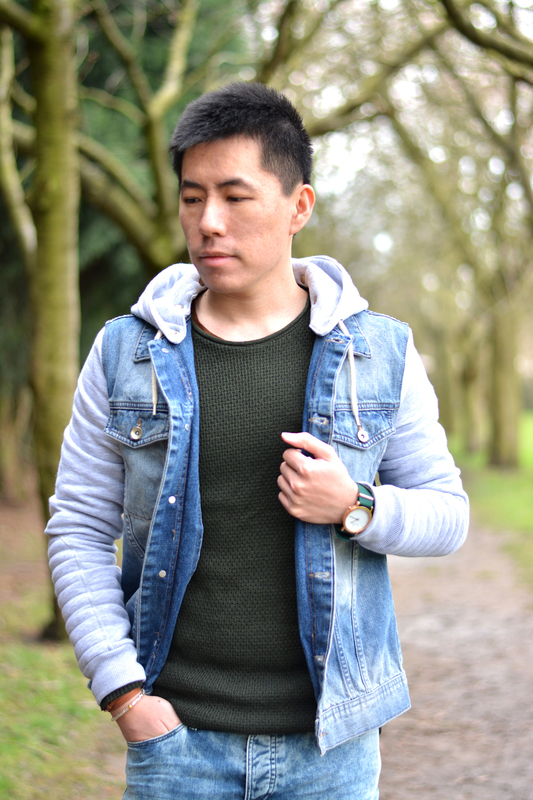 HEAD TO TOE: River Island Denim Jacket with detachable hood, River Island Knitted Jumper, River Island Washed Jeans, Thread Etiquette Anchor Bracelet, Thread Etiquette Geo Beads, Thread Etiquette Prince Watch, Topman Boots. For me, Thread Etiquette is limitless. There’s no restriction in aesthetic nor age. Please visit Thread Etiquette for more wrist candies and follow them on social media for more updates! Happy Socks and The Visionist are giving you an opportunity to participate in our giveaway this week. 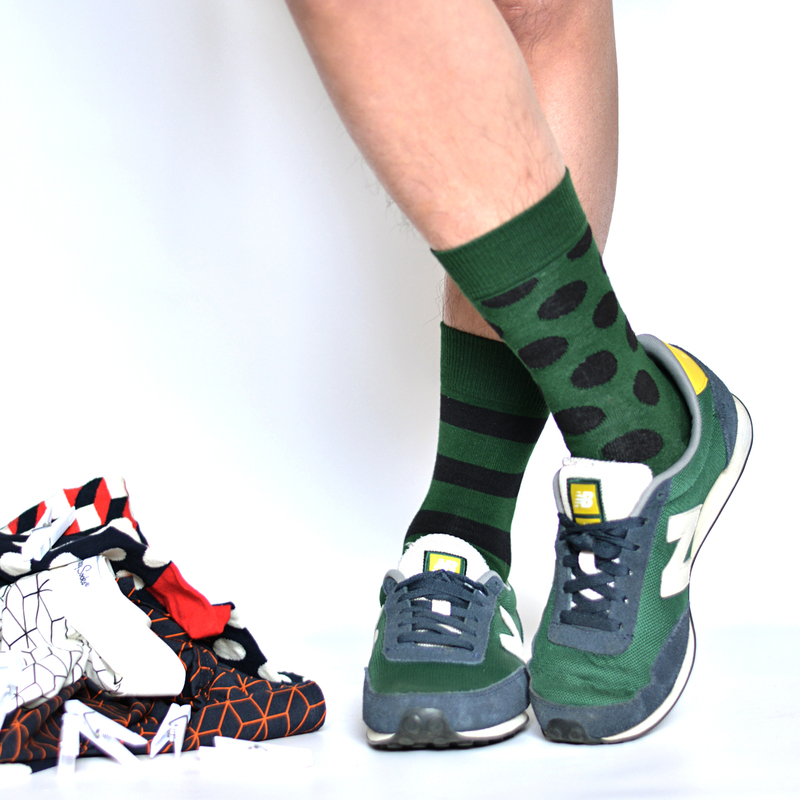 This giveaway is sponsored by Happy Socks and we will be choosing three very lucky winners! £35 Happy Socks Gift Card for each winner. 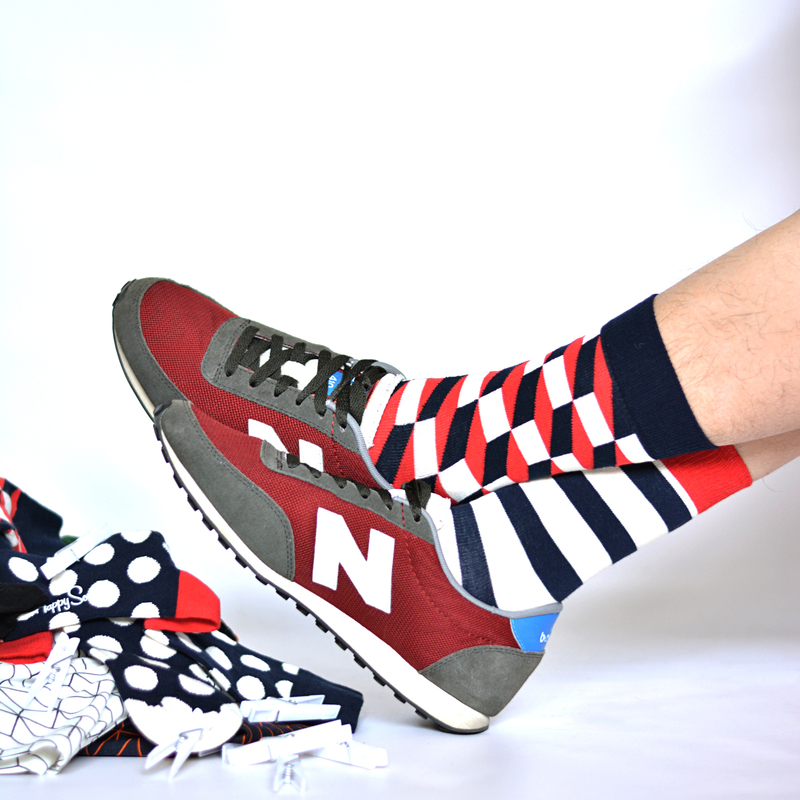 Happy Socks & The Visionist will select three lucky winners randomly. 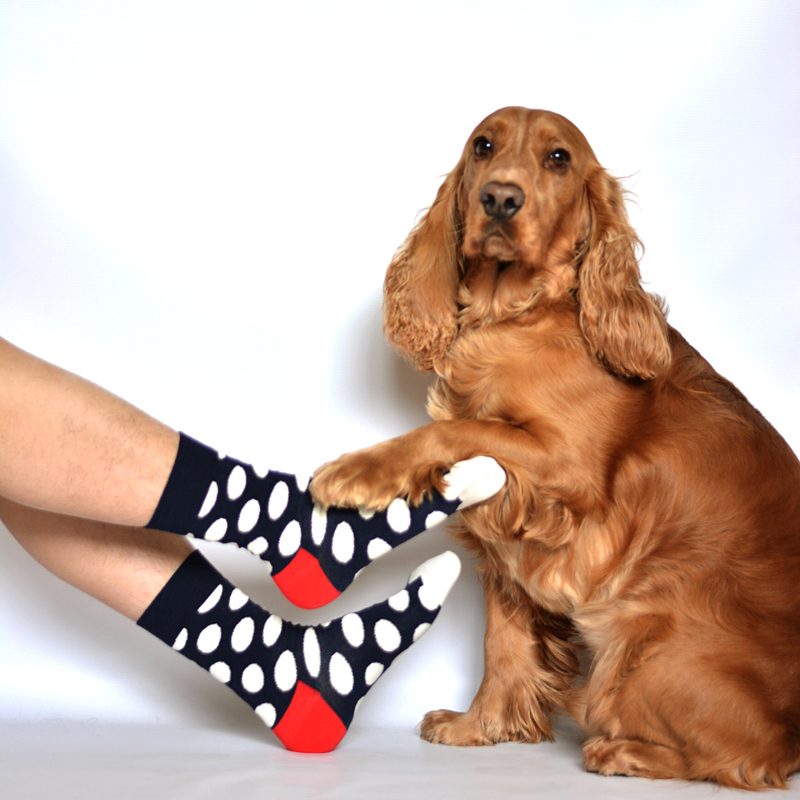 Happy Socks was founded by two friends who had one vision: to spread happiness by turning an everyday essential into a colourful design piece. For me, Happy Socks isn’t just about the colourful design. There are many colourful socks and underwear in the market but majority of them look terrible in my opinion. However, Happy Socks has managed to design many creative, exquisite, and colourful socks and underwear, that truly bring you the daily happiness. 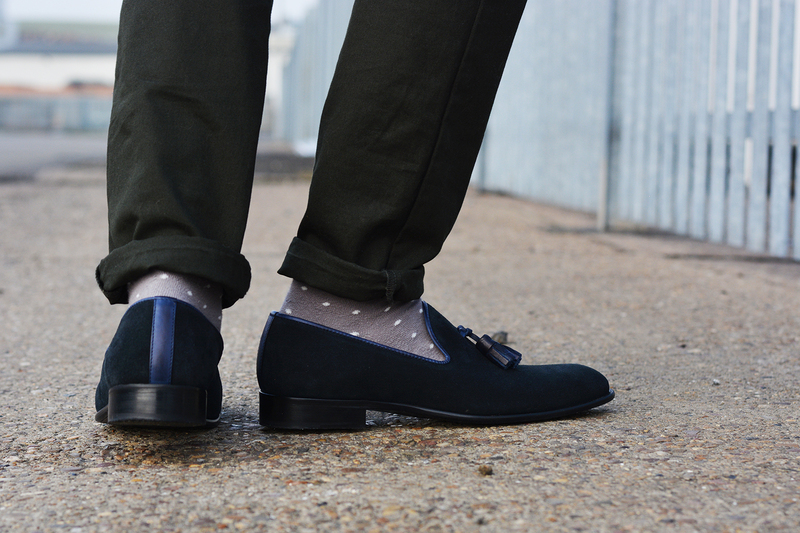 Happy Socks are suitable for street style as well as a more dandy office attire. All of the Happy Socks are unisex. The quality is premium and very durable. Happy Socks has three different types of underwear, boxer briefs, and boxers for men, and briefs for women. They are very comfortable for your skin due to the premium quality of the materials. Please visit Happy Socks for more fun and creative socks & underwear and follow them on social media for more updates! Moreca is a combination of a craftsman’s passion, high-end design and the most modern technologies. All of their products are handcrafted in Kyiv, Ukraine. 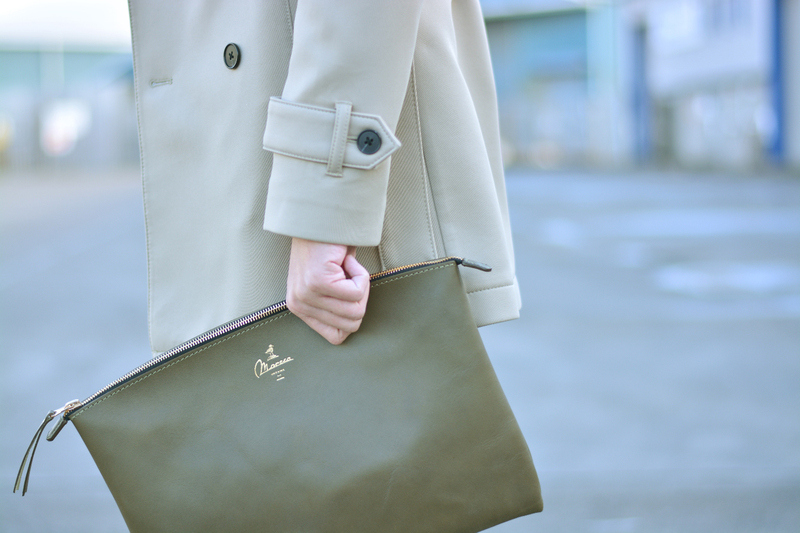 I am totally in love with this 13″ Laptop Pouch Olivgrun as I have been looking for a beautiful olive/green colour laptop pouch for a long time. This is definitely the one! This Laptop Pouch Olivgrun is a perfect accessory on the go. It fits perfectly with my 13″ Macbook Pro. For the Macbook Air users, you can definitely fit in a couple of notebooks and stationery too. 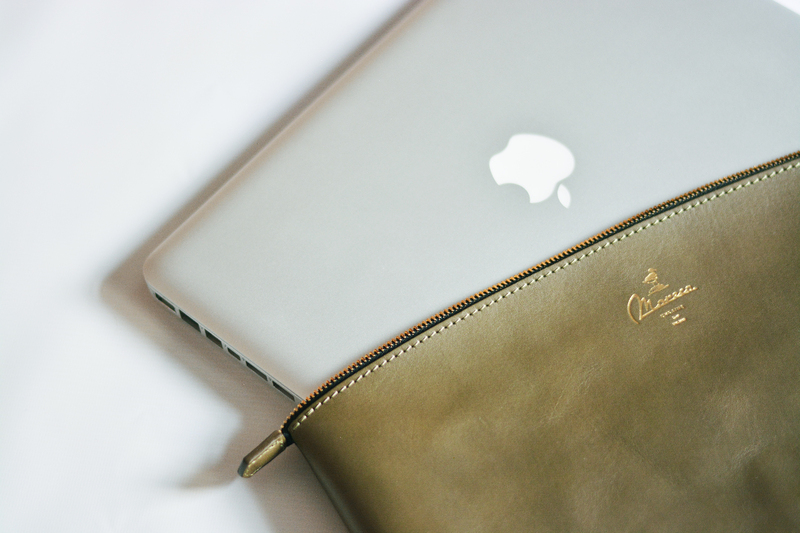 This Laptop Pouch Olivgrun is made from the best Italian vegetable tanned calf leather with a brass zipper. The minimal design of their products give you the versatility in accessorising. If you are looking for a daily pouch that can fit in your iPad/tablet, stationery, notebook, wallet and your mobile phone, this is certainly a good recommendation. The multifunctional pouches comes in various sizes and colours such as black and brown too. For those who appreciate a minimal aesthetic of leather goods, Moreca is a good choice without a doubt. Please visit Moreca for more multifunctional leather goods and follow them on social media for more updates! 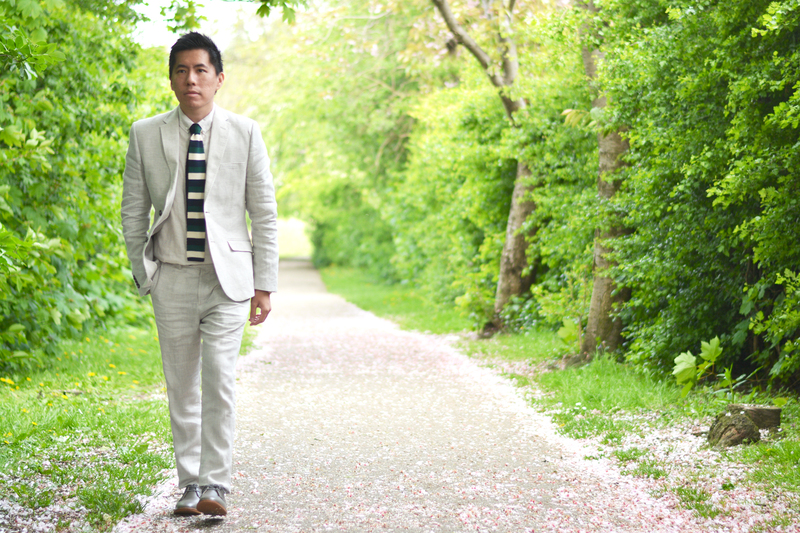 Paul Evans was founded by a couple of guys in New York city who want you to look good. All the shoes are made in Naples, Italy, from the hands of skilled artisan. 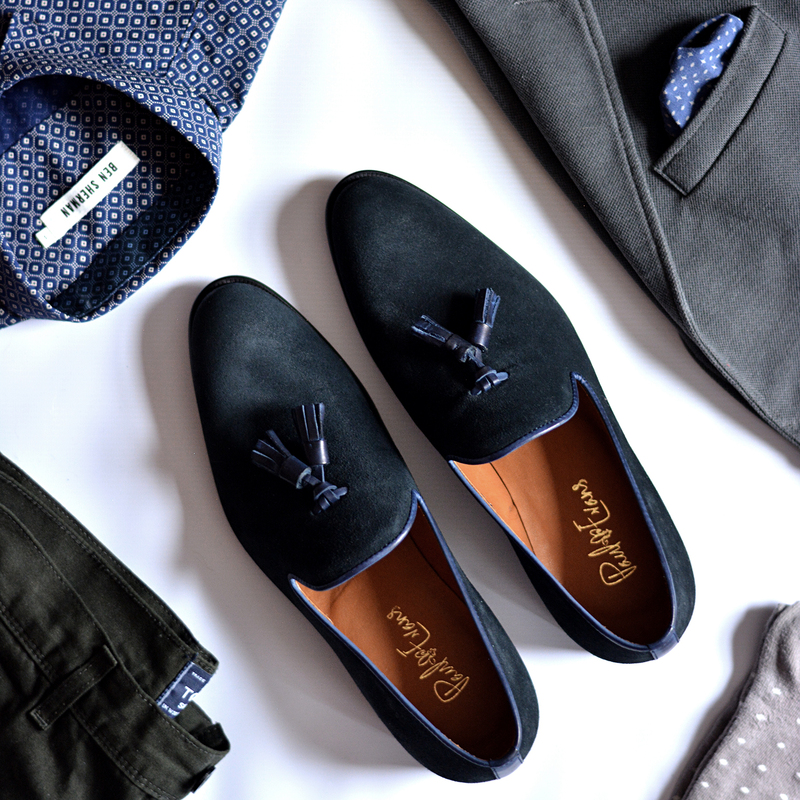 This pair of Chaplin Tassel Loafers come in few different colours. 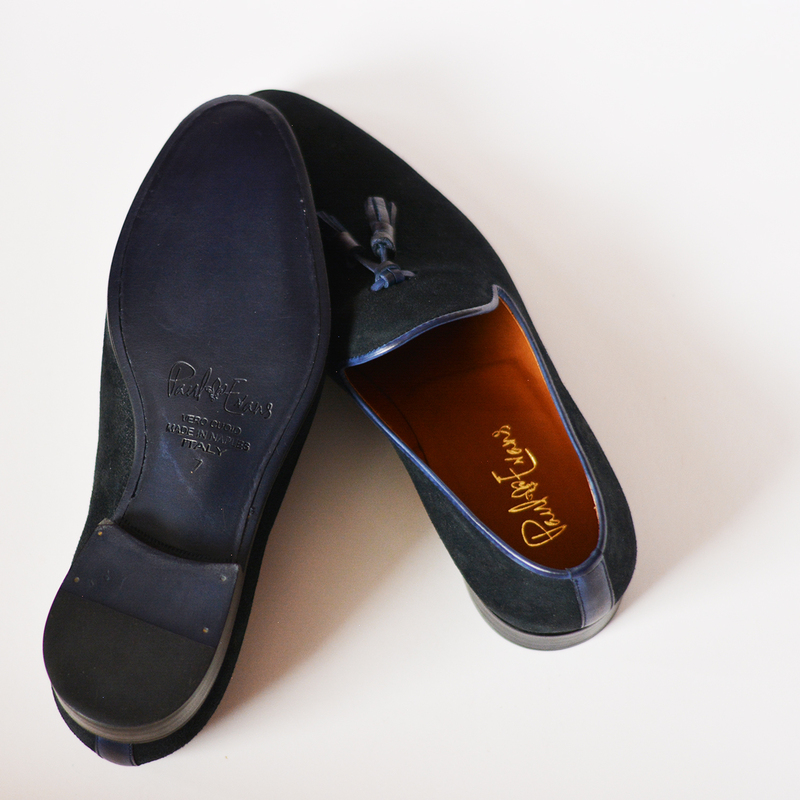 Apart from their sleek design and fine quality, the most surprising aspect of their shoes is the comfort. I have a few pair of loafers myself and this is the most comfortable pair I have ever owned. 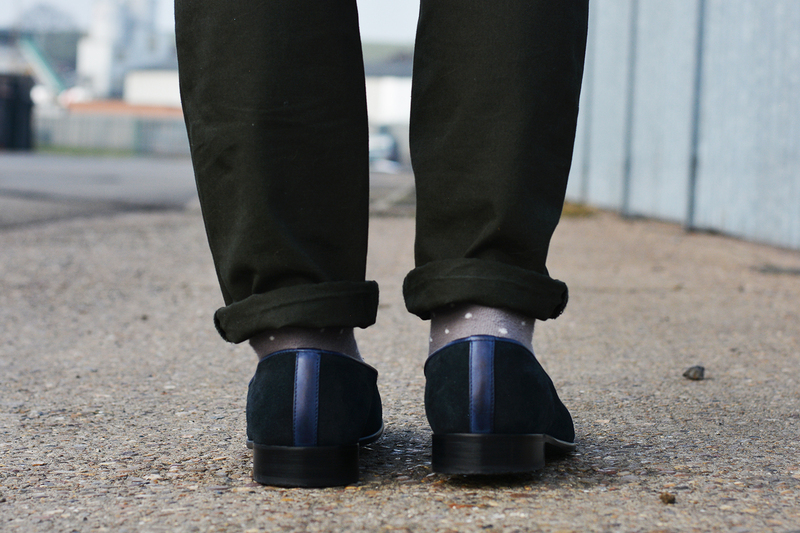 Loafers can be worn as smart footwear or casual footwear. 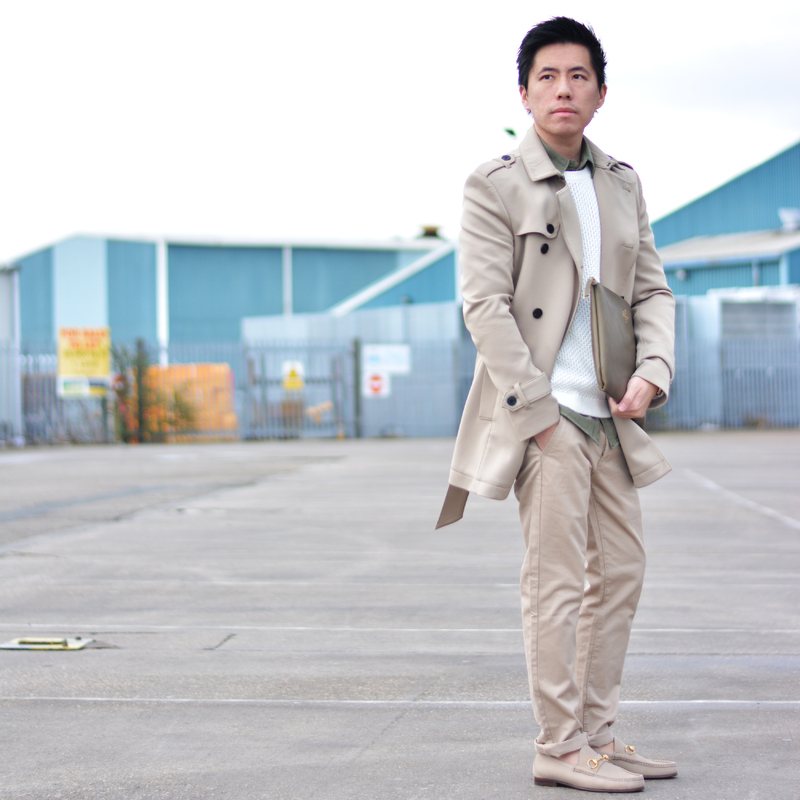 But instead, I have styled them with a casual smart attire as I like the effortless aesthetic for an easy day out. 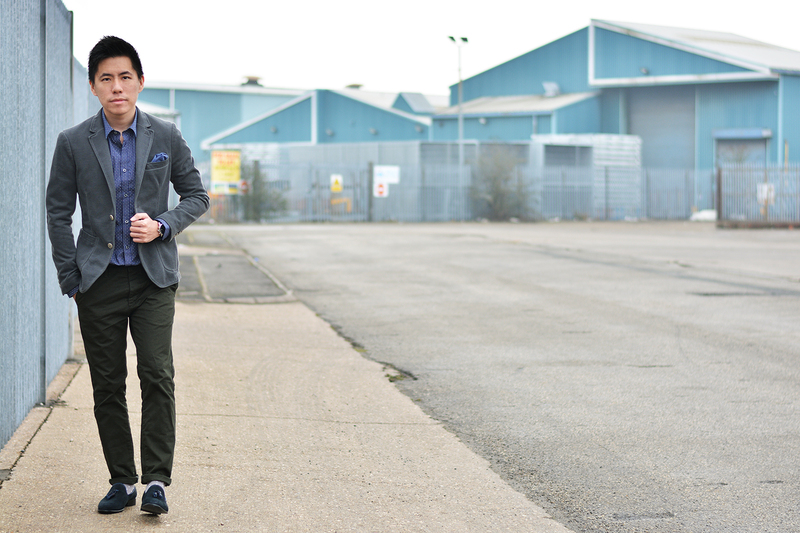 HEAD TO TOE: Zara Cotton Blazer, Ben Sherman Printed Long Sleeve Shirt, Topman Olive Green Trousers, Grey Polka Dot Socks, Paul Evans Loafers. The calfskin leather stripes at the back of the loafers indicate how much Paul Evans pay attention to the details in their designs. Each pair of shoes from Paul Evans also comes with an ox horn shoehorn. 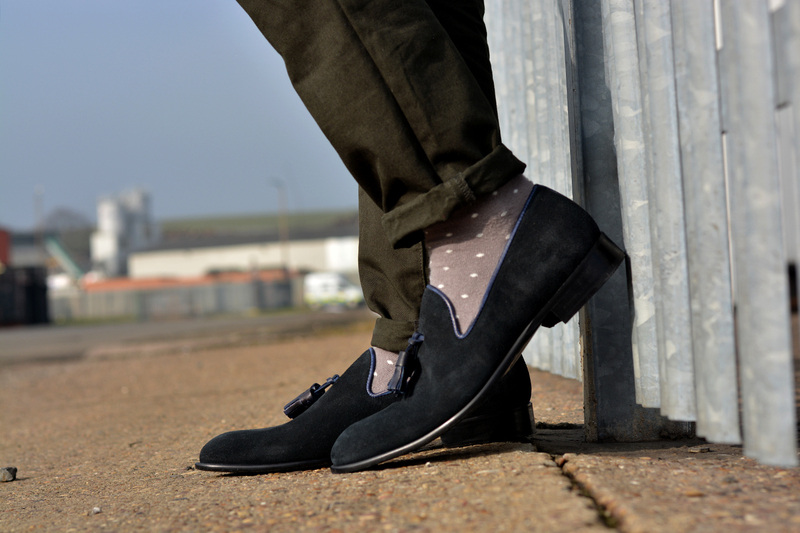 Please visit Paul Evans for more Italian handmade shoes and follow them on social media for more updates!